I have long had a thing for baguettes. I think it’s partially because they’re French and partially because they taste so good. I just love the crackle-y crisp deep gold crust and tender insides. Once, I even asked Mike to bring a baguette back for me when he went on a trip to France. The funny thing is, we weren’t even going out at the time so I was just asking, as a friend. And he delivered! Maybe that’s when I feel in love a little bit. We meet up after his trip and I had completely forgotten about the baguette, but he had one for me, still in its paper bag, kind of crushed and more than a little bit stale. But, it was there and for the first time ever, I had an authentic baguette! That started a lifelong affair with baguettes and I’m forever on the search for a good one. So, when La Brea Bakery asked me to try out their new Reserve baguette, I was really excited. I hopped on over to the grocery store, picked up a bunch of them and then proceeded to devour one with a bunch of butter. After my baguette craving was satisfied, I felt like a sandwich because I’m a monster and I eat a lot of bread and baguette sandwiches are my jam. Typically I go for a classic ham and cheese but this time I felt like going all out and making a meatball sub. I have major heart eyes for meatball subs. 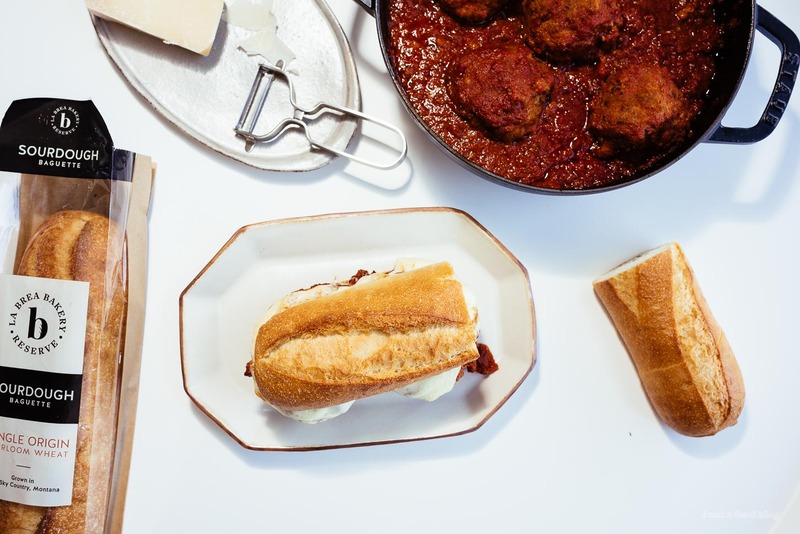 It’s kind of a new obsession for me because when Mike and I went on our epic road trip last summer, meatball subs were one of the things we would eat while we were on the road. Well, not literally on the road, we just ate a lot of them on the side of the road. Mike is a meatball sub fiend and somehow I got sucked into it and now I think I’m some sort of expert on meatball subs or something. Just kidding, I’m not an expert, but I do know what I like: big, soft and tender meatballs. I feel like meatball subs shouldn’t have meatballs that have been crisped up or browned in anyway. Instead I love it when the meatballs are braised and soft and are easy to bite into. 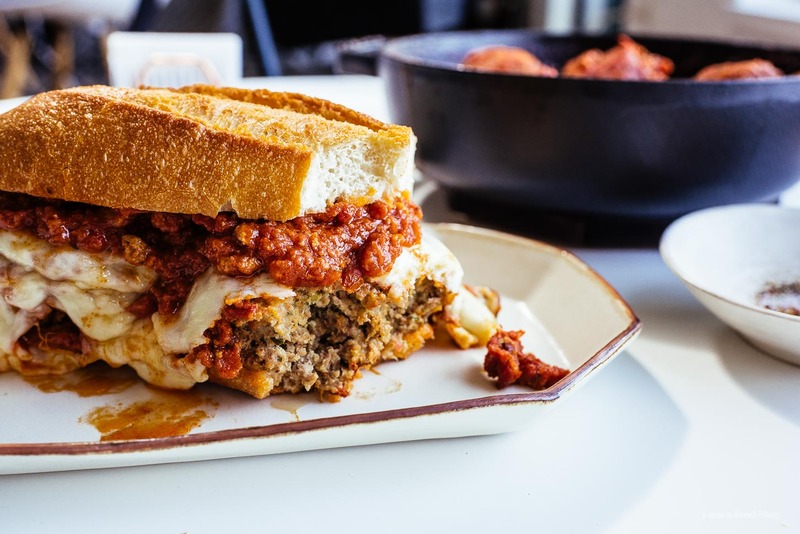 The sauce should permeate the surface of the balls and they should be good enough to eat on their own but even better when put into a saucy, cheesy sandwich. Here’s how I like to build my sandwiches: cut your bread of choice in half (obviously I used a baguette). The bread doesn’t need to be toasted because you’re going to pop in it the oven and to be honest, you don’t want too toasty of a bread because it’ll contrast too much with the tender balls and make eating difficult. After the bread is sliced, you need to sauce your bread. I know that some people don’t put sauce on the bottom of their subs, but I feel like you need that sauciness. Top the sauce off with a bit of shaved parmesan then with saucy meatballs. On top of that you need a cozy blanket of low moisture mozzarella cheese and a shower of more parmesan. The other side of your sandwich should get some extra sauce too. Everything is popped into the oven until the cheese gets gooey and delicious. Then you just close it up and you’re in meatball sub heaven! And just to finish off, a couple of words about La Brea Bakery’s new Reserve breads. These baguettes have a crisp crust and creamy crumb because they’re made from single origin heirlooms grains – specifically Fortuna Wheat grown in Big Sky Country, Montana. I’ve always wanted to drive through Montana and see the wheat fields. They sound absolutely gorgeous and apparently Montana is the place to grow wheat because of the soil, climate, topography and weather. For more details (there’s a really cute animated video) and a coupon, check out this link. You can find La Brea Bakery Reserve in the specialty cheese shop at your local Krogers. I found mine at Ralph’s, and we got the cheese from Murray’s Cheese, a place deep in my heart. 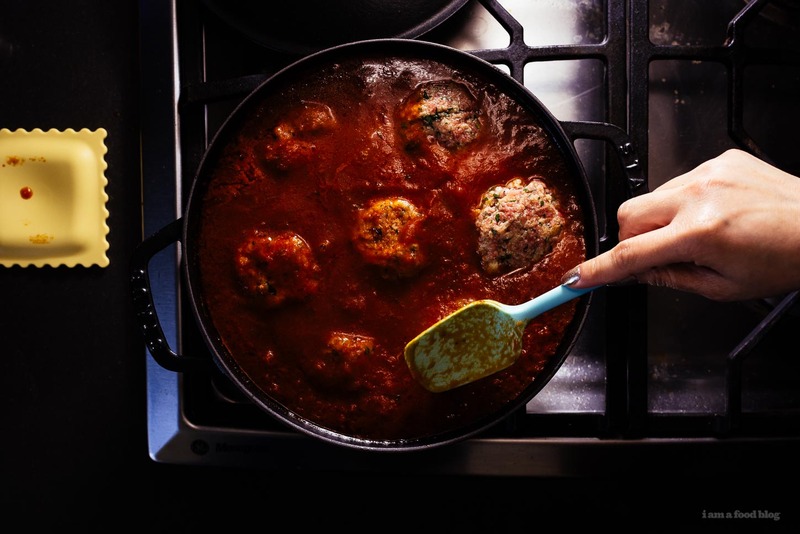 In a large skillet or saucepan with a lid, heat up your tomato/marinara sauce over medium low heat. Place the bread cubes in a bowl and cover with milk, tossing so that all the cubes are saturated. After 1-2 minutes the bread should be soggy and wet. Using your hands, squeeze out as much milk as possible. Use your fingertips to break up the bread into very small breadcrumbs. 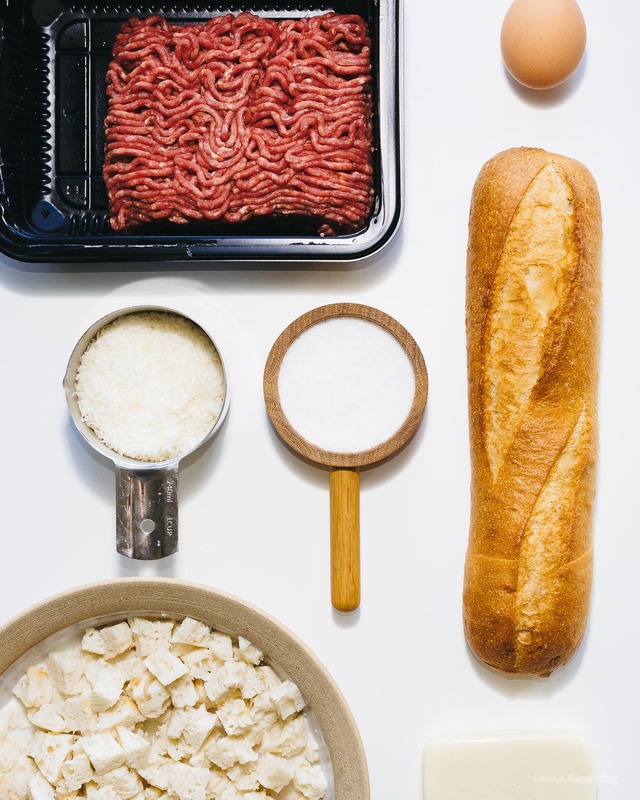 In a large bowl, mix together the bread, ground beef, eggs, garlic, parmesan, flat leaf parsley, salt, and freshly ground pepper. 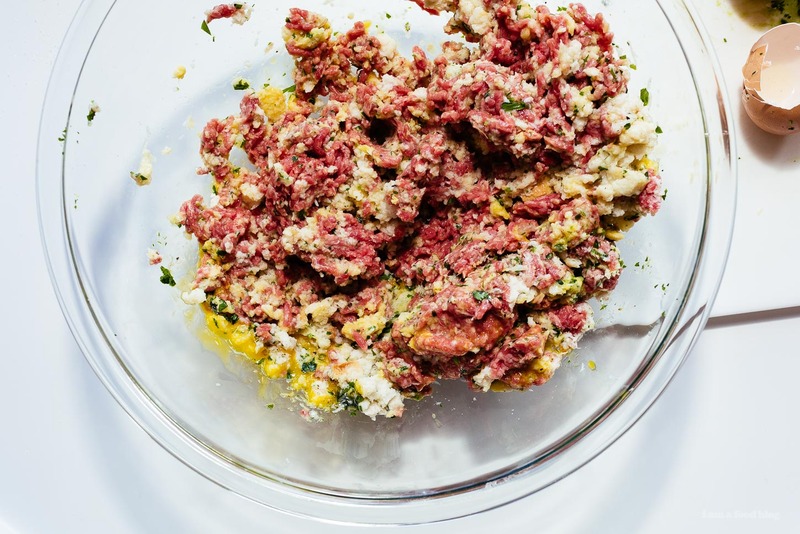 You want to mix everything so that it’s homogenous, but loose – don’t work the meatball mixture too much. By this time your sauce should be simmering with several bubbles breaking the surface. Form large meatballs (I made 7 big ones) and drop them directly into the sauce. Simmer in the sauce, partially covered, over medium heat, flipping occasionally. Simmer gently until cooked through, about 25-30 minutes. Cut the baguette in half so you’ll have two sandwiches, then cut lengthwise. Top both sides of the baguette with a generous amount of sauce and a bit of grated parmesan. Place the meatballs on the bottom baguette and top with slices of mozzarella and some more parmesan. Bake until the cheese is gooey and melted. 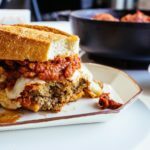 Place the top half of the sandwich on top of the meatballs and enjoy! Notes: For my bread cubes, I trimmed the crust then cut up one La Brea Bakery Reserve French Demi Baguette. We partnered with La Brea Bakery to bring you this post, but all opinions are our own. La Brea Reserve is available at specialty cheese shops in your local Kroger store. Click on the La Brea site for recipes and a coupon! Thanks for supporting i am a foodblog! Is that a sourdough baguette?? Hooray for meatballs and sourdough! Great recipe! Just made meatballs the other day and our recipes are alike but I add anise seeds and minced onion. Found an easy way to get this meatball mixed without overworking meat is soak bread and milk until “squishy” 😊 and then add the eggs, cheese and herbs/spices to milk mixture. Mux well then add the ground beef. It mixes fully in smooth and the meat is much easier to work with. Thanks so much for recipe. Delicious! I am on meatball duty today and will certainly try your recipe. I think using 3 meats will make these stand out! Thanx for sharing!